Here’s an easy and delicious homemade hors d’oeuvre to be served with drinks before dinner. They can be stored in a tin for a week or two. A tin of these cheese pennies makes a terrific gift! Place the flour, salt, black pepper, dry mustard, softened butter and shredded cheese in a medium-large mixing bowl and mix well. Taste and adjust the seasoning, if necessary. (Some people leave the butter and the cheese out at room temperature over night to soften and sharpen.) You can add a few grains of cayenne pepper if the cheese is not strong. Form into marble size balls, place on a parchment lined baking sheet, and press with a fork. 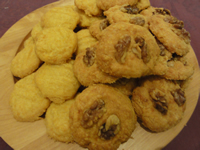 Place on the top of each cheese biscuit, a pecan half, a sprinkling of sesame seeds, or leave plain. Bake in a preheated 375 degree oven for 15 to 20 minutes or until lightly browned. Let cool a few minutes before removing from the baking sheet. Note: You could also place the dough on wax paper and roll into a cylinder about the size of a 25-cent piece. Chill this for 30 minutes, then slice the cold dough about 1/4 inch thick and bake as above.